Just a few minutes before 11 a.m., organizations begin to occupy the empty tables lining the walkway in front of Santa Monica College’s library. As SMC’s various eco-themed clubs set up and decorate their booths, a few students stop and linger, curious about the unfolding displays before them. In a few minutes, booths and workshops on environmental education from the Dakota Access Pipeline to the benefits of a vegan diet, breathed life into the once empty space. It’s Earth Week at Santa Monica College. 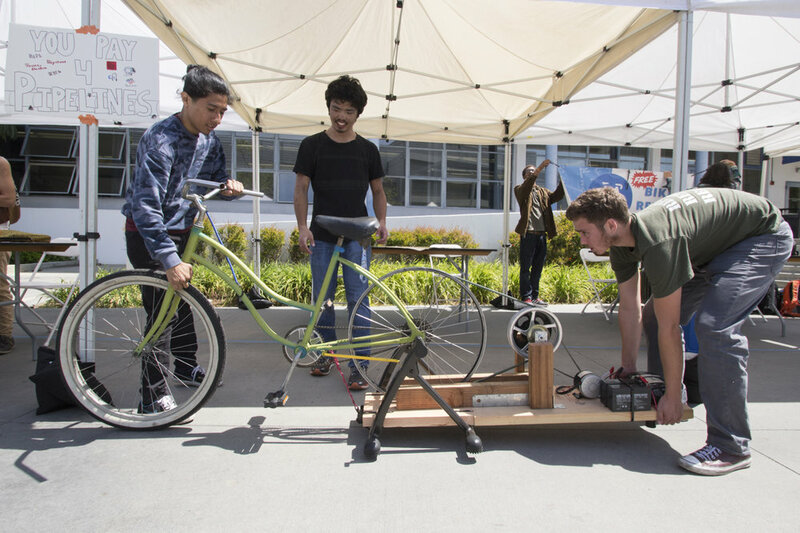 With environmental awareness at its core, Earth Week is packed with several activities hosted by SMC’s environmental clubs, like the Eco-Action Club and the Bike Club. Tuesday's events featured several workshops focused on educating students about their roles in the current environmental situation. The construction of the Dakota Access Pipeline (DAPL) sparked a nationwide debate concerning the corporate role in global environmentalism. According to the Defund DAPL website, over 20 banks are funding the construction of the DAPL. Although DAPL’s construction is in North Dakota, in the northern plains of the US, SMC’s Eco-Action Club teaches students how to tackle the issue here at the local level. “We want to reach as many people as we can at the local level in your community, in your daily life. A lot of our workshops are trying to do that,” says Morales. The booth is managed by Tamara Kase, a supporter of Divest LA, Revolution LA, a water protector and a witness of Standing Rock. She informs people about how to take their assets out of the banks supporting DAPL. Not only should someone divest from these banks, but Kase notes that it's also important for the individual to be provided with information on alternative banks that do not support DAPL. Kase’s booth featured a list of banks that are not funding pipelines. Other organizations at the event included SMC’s Plastic-Free booth, where Padre learned about the hazardous effects of plastic in the ocean. He laughed to himself after the group's information convinced him to invest in a non-disposable water bottle. A large sign reading, “BIKE POWERED PHONE CHARGER,” was enough to attract a few intrigued students. The point of the display was to show that kinetic energy can be efficient and clean. Joshua Bonilla and Henry Haprov explained the mechanism. “It is a bike that we’ve converted into a phone charging station. “It uses energy that you create when you’re riding on the bike to power this motor, and then power the battery, which in turn powers the phone charger,” said Haprov. “It’s showing how the bike can be environmentally friendly. For transportation, but also the energy to charge your phone doesn’t just have to come from fossil fuels,” said Bonilla.